B Shawn Cox shared the same gallery space with Marty Lewis, who I featured two days ago. The two made a good team and the room had a fun festive quality. 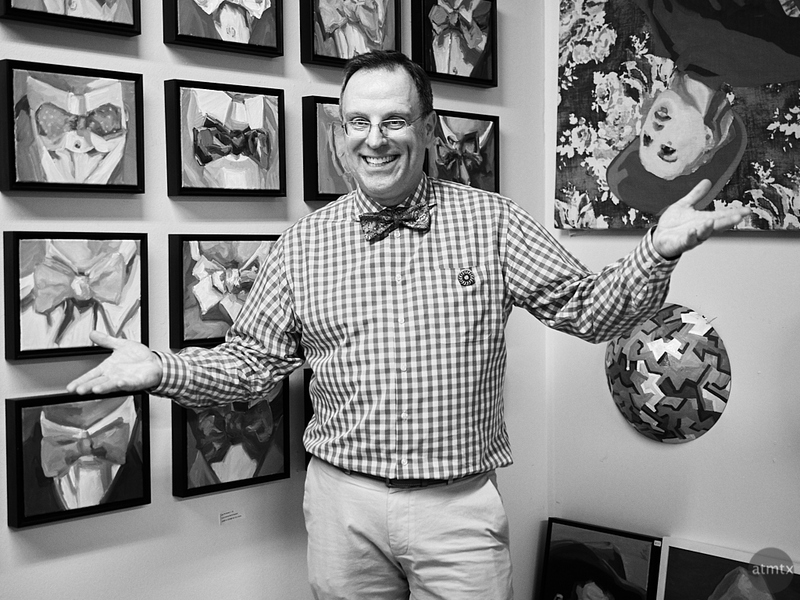 The bow tie variations behind Shawn may be his signature work. His business card and the front page of his website, also features them. While he has individual works, he seems to like variations on a theme. He had ones of light bulbs which would look especially striking on a wall of a restaurant, I thought. I discovered that Shawn didn’t start out as an artist but moved into this creative field from a previous life. I could identify with his story since I find that my creativity around photography and blogging continues to grow in importance. Making a living is great, perhaps in a more empirical field. But the creative arts feeds the soul and makes life worth living. B Shawn Cox’s work can be found at www.bshawncox.com.